It seems that in today’s American culture the undead, zombies, vampires and all things that go bump in the night are the most favorite subjects for major motion pictures, television shows, and video games. Many people can’t get enough of this stuff! It’s all in good fun, with the ultimate goal of being filled with sheer terror as you watch. Everyone knows this is fantasy, everyone knows there are no such things…Right? Well, next month, on April 6, the good citizens of the Gulf Coast (ages 14 and up) will have the opportunity to come face to face with these beastly creatures during daylight, as they run for their very lives to escape the carnage that will ensue if they are caught! Blood thirsty, flesh eating, disease ridden zombies will take over the Harrison County Fairgrounds for one full day of blood curdling, scream filled fun at the first annual Gulfport Zombie Run. Are you up to the challenge? Do you think you can survive the onslaught as wave after wave of zombies chase you down, hoping to catch you and make you their next meal? DO YOU? Can you run? Are you fast or are you a couch potato? Do you think fast on your feet? Are you cunning and smart or lumbering and slow? The zombies don’t discriminate…they feed on EVERYONE. The Zombie Run is the brain child of Vermont business man, Richard Vaughn. His hobby is buying and selling computer domains and he purchased http://www.zombierun.com five years ago, just because he got a kick out of the name. He got offers to buy it repeatedly but decided not to sell. He started to post cryptic notices on facebook to check out public interest and it took off like wild fire. He got the idea from a filmmaker who staged a zombie run to help promote his horror flick in Virginia. It began at 6 in the morning. Word spread quickly and people came from everywhere to see it and take part in the action. 1,500 people showed up…on a Sunday! Richard was so impressed he decided to host his own zombie run at the fairground in his Vermont hometown which was sitting vacant at the time. The response was nothing short of amazing! He put it all together in just 7 weeks. Weather is always a factor with plummeting temperatures and quite often snow, but the first Zombie Run went off without a hitch in the very cold month of October. “People loved it and are very interested in coming back and doing it again. We learned so much and had the best time,” Vaughn said. 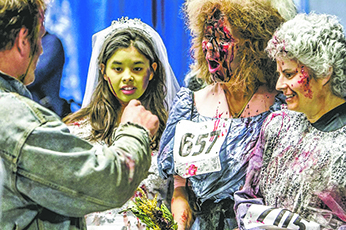 Gulfport, Mississippi was selected for the second Zombie run for a number of reasons. Vaughn began looking into venues in the South and decided it would be the perfect location. He traveled much of the time for business and was quite familiar with the area.”I found the absolute jewel in the Harrison County Fairgrounds. It was exactly what I wanted; convenient, a safe environment, great parking, and a wonderful infrastructure. The grounds are fairly level, with just enough woods to run through and good spots to put our obstacles,” Vaughn said. He was also particularly taken with the staff at the Fairgrounds, who could not have been more helpful or accommodating. How about crawling on your belly under chicken wire with zombies above you that are dripping with goo? Travel through Apocalypse Alley as you try to escape while navigating through body bags filled with decaying body parts! And this is just the beginning. At the time of this writing, it was also quite possible that participants would have to shoot zombies with paintball guns as they slowly drag through the forest. You will stop at a designated station and receive your weapon but you have to act fast and have a very good aim as these are moving targets. Keep in mind, zombies are constantly chasing you so you cannot let down your guard for even a moment! There is much, much more to experience as you travel through the course, but half the fun is not knowing what else awaits you. The Zombie Run is not timed and all obstacles are optional, so if you chicken out…no worries! This is the kind of event that you can’t survive on your own. You need team mates, friends or family who will remain steadfast. Remember, the zombies are not impressed if you are a star athlete and they don’t care if you can barely walk and chew gum at the same time. They just keep coming and their objective is clear! Get your team together and plan your strategy so you all will come out in “one piece” at the end of the race. “There is no way to make it by yourself. You need to work together. This is intense, you will be mentally and physically exhausted but you will have a blast trying to outsmart and out run the zombies who keep coming at you the entire time,” Vaughn said. Vaughn is bringing a staff of assistants with him from Vermont and St. Louis. They are experienced zombie handlers, and show no fear. Upon their arrival to the Coast, they will be joined by a local force from Gulfport. “Hands On Mississippi” is a volunteer organization who will be providing four teams (40 people) of workers for the Zombie Run. They will oversee the parking lot, man the registration tables, serve as safety monitors during the race, and apply all the make-up to the zombie characters. A group of theater students is doing the special effect make up applications. They will be trained for the task during a special make-up workshop under the tutelage of an expert make-up artist who is with the company, Nightmare Vermont. They are known for outstanding work in creating haunted houses and working in cinema quality make-up. “We have to prepare 150 zombies in very short order. It is almost like an assembly line; a blood station, a burn station and a gore station. Everything must be done very quickly but also very well and with great care,” Vaughn said. Richard Vaughn has named Smile Train as his charity partner and national sponsor in the Zombie Run, LLC venture. He was drawn to Smile Train and felt deeply compelled to support them through donations because his daughter is a patient. She was born in China with a cleft palate deformity that was quite severe. The Smile Train surgeon repaired it and to quote Richard Vaughn, “did a world class job.” The Smile Train is a leading children’s charity that provides cleft palate surgery to those in need in the United States and around the world. As of February 11, Smile Train surpassed 850,000 free cleft surgeries. A cash donation is also being provided to Hands On Mississippi in exchange for their assistance with the Gulfport Zombie Run. “A percentage of our receipts will be donated to Smile Train and other charities regardless of profitability,” Richard Vaughn said. The ultimate goal as a result of the Gulfport Zombie Run is that fifteen children will be provided with free cleft palate surgeries through Smile Train. So please come out to the fairgrounds for the first ever Zombie Run on the Mississippi Gulf Coast. Tickets are going fast, so don’t delay! Gates open at 9:00 a.m, first wave at 10;00 a.m. Check out facebook and zombierun.com for more information. Thank you for supporting Smile Train!